CyclingJoe: ANOTHER New Bank in Dunwoody Village??? ANOTHER New Bank in Dunwoody Village??? We’re getting ANOTHER BANK in Dunwoody Village. How does this make you feel? 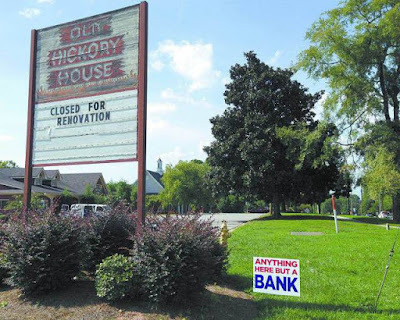 Sun Trust bought the Old Hickory House on Chamblee-Dunwoody. For whatever reasons, the Texas-based restaurant chain that originally bought it well over a year ago pulled out (Word was they didn’t like the heavy restrictions required by our City which requires building everything to look like Colonial Jamestown – Why are we requiring this anyway? Talk about being business unfriendly). If our city council does not act, or a gracious Angel Investor appears, Sun Trust will be opening their SECOND location in the Village. We already have at least TWELVE banks in the Village. Do you know what the real purpose of these brick & mortar banks actually serve? They operate at a LOSS to the corporation and simply act as billboards & advertising. I’ve only stepped in to a bank once in the past three years. What can we do as citizens? Do you believe that our City Council acted properly when they bought the “PVC Farm” in Georgetown to prevent more new apartments from being built? Do you believe it’s prudent to have proper oversight to protect our community and neighborhoods? Do you believe that we citizens spoke loud & clear when offering input to the Dunwoody Village Master Plan; in that it should be a “human-based” area, with a “sense of place” for our community to come together; including public green spaces, small shops, walkable and great places to eat and meet your neighbors (think Canton Street in Roswell)? Do you believe that our City government is OF, BY and FOR the PEOPLE and is empowered to act proactively? Or, are you simply sick & tired of seeing all of these banks and know there’s a better alternative? If you say yes to these, then contact our Mayor, Denis Shortal and the City Council members and insist that they simply PURCHASE the land. E-mail: councilmembers@dunwoodyga.gov or call: 678-382-6700. Once purchased, follow a much simpler model from the PVC Farm and sell it back to the private sector in a way that respects our residents and follows the spirit of the Dunwoody Village Master Plan. A vision that puts PEOPLE FIRST over drive-thrus or more car parking. 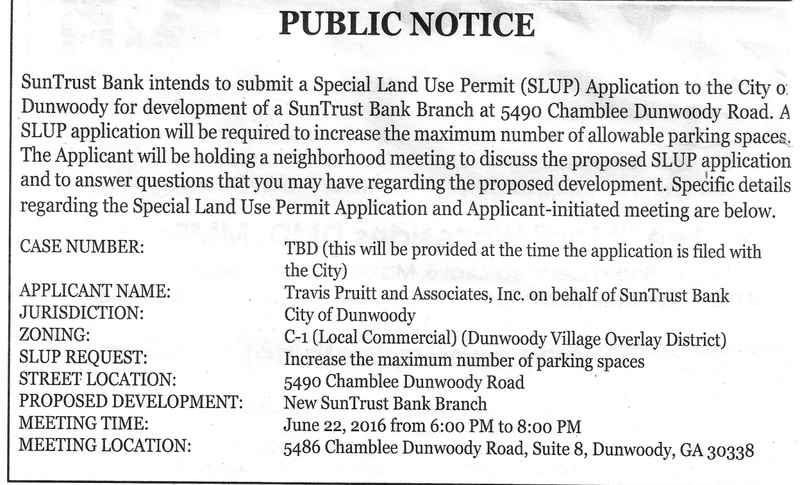 Sun Trust is holding a neighborhood meeting this Wednesday, 6/22 from 6-8 pm at 5486 Chamblee Dunwoody Rd, Suite 8. Show up and speak out. PS: Shout out to Gary Ray Betz aka “Copperhead Hunter”. Where’ve you been? Missed hearing from you and reading your eloquent prose! Love your You Tube videos, especially your "A Cure for Dementia" using snake venom and am anxiously waiting to purchase one of your coveted T-Shirts. Pray tell how we can buy one? You are correct, it has been very quiet on the copperhead front as my efforts to have the City of Dunwoody establish a copperhead refuge at Brook Run Park was repeatedly rejected. I still fail to comprehend the city's attitude on that - the proposed area was far from the playgrounds and only a half acre. These wonders of God's majesty need a safe place away from the cyclists that continue to disregard their right of way in the bike lanes! Then the copperhead I had been milking to prevent dementia died in my crawlspace terrarium - this event has been most crippling to my psyche. She had been with me for over five years. I had named her Eurydice, and since her death, senility has had its way with my mind, and at times I dream I'm Orpheus traveling to the underworld to retrieve her, my Eurydice. But always before I wake instead of successfully rescuing her via a manhole underworld portal, a cyclist casually wheels out of the bike lane to run her over. Joe, it was not the exterior finish requirements that caused the restaurant to put the property up for sale. The site did not have all the parking spaces they wanted and the neighboring shopping center would not allow the use of any of their parking. 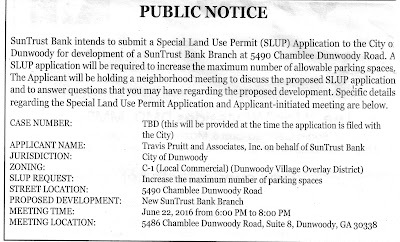 A bank does not need the parking a restaurant requires, but Sun Trust wants more parking too...thus the SLUP application. I expect the sale is subject to a successful SLUP application to allow more parking. It appears that Bicyclists are not the banks target market. The DV Overlay district mandates less parking than the city Standard requirement, but businesses want more than the minimum requirements. At fhe Wednesday meeting Ask the Banks civil engineers why they need more parking. Is there a digital petition that we can sign if we cannot attend the meeting?? ?